Hiya guys! I'm really pumped this week as I usually am when PPU rolls around. There is an air of swiftness to the event that pumps up the adrenaline rush. You have to be in your toes ready to buy, buy, BUY! Okay, maybe I have a little too much adrenaline haha. Moving on... Today I'm sharing swatches for Poetry Cowgirl Nail Polish's August contribution to the Polish Pickup Collaboration. If you're not familiar with the concept, the Polish Pickup offers a fun, interactive experience that allows you to submit theme ideas, vote for your favorite theme, and selectively purchase your favorite polishes every month. This is the first time Kristen makes an appearance in this event and she's come in for the theme Old Hollywood. So let's jump to it and get to the swatches! 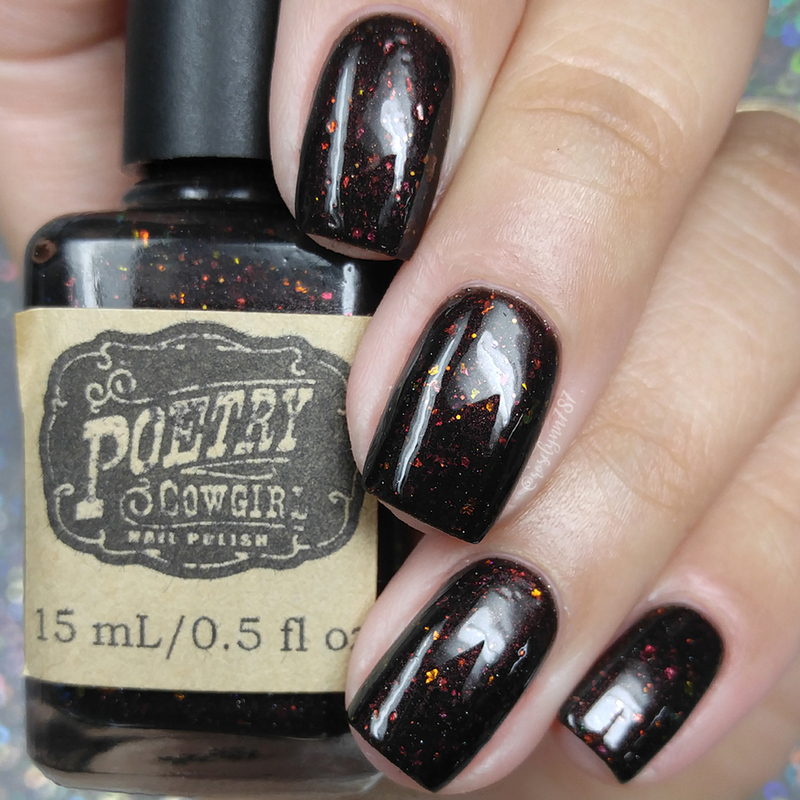 Frankly, My Dear by Poetry Cowgirl Nail Polish will be available for purchase through the Polish Pickup Shop August 4th through August 7th. This full-size shade will retail for $11.00 each. Frankly, My Dear is inspired by the classic movie Gone With The Wind and the the iconic quote - "Frankly my dear, I don't give a damn". But also deeper than that, it embodies the smoldering sunset movie poster. Side note, every time I see the name of this polish I ended up finishing the quote in my head haha. 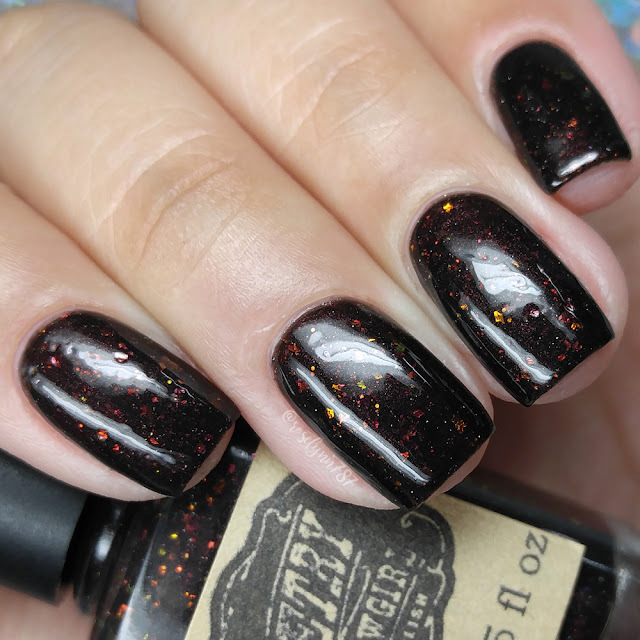 Frankly, My Dear can be described as a black jelly packed with red/orange/gold UCC flakies, iridescent chameleon glitters, silver holo micro glitters, and a red flash. The formula has a sheer application as to be expected from a jelly. 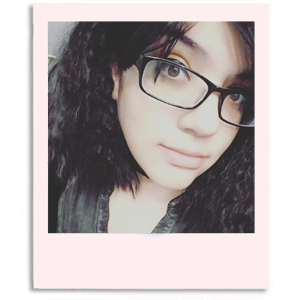 The consistency runs on the thick side, but it's perfectly manageable and layers with ease. It dries down to a minimal gritty finish that smooths out after topcoat. Also giving it that squishy look we all love. Shown here is three coats sealed with a glossy topcoat. 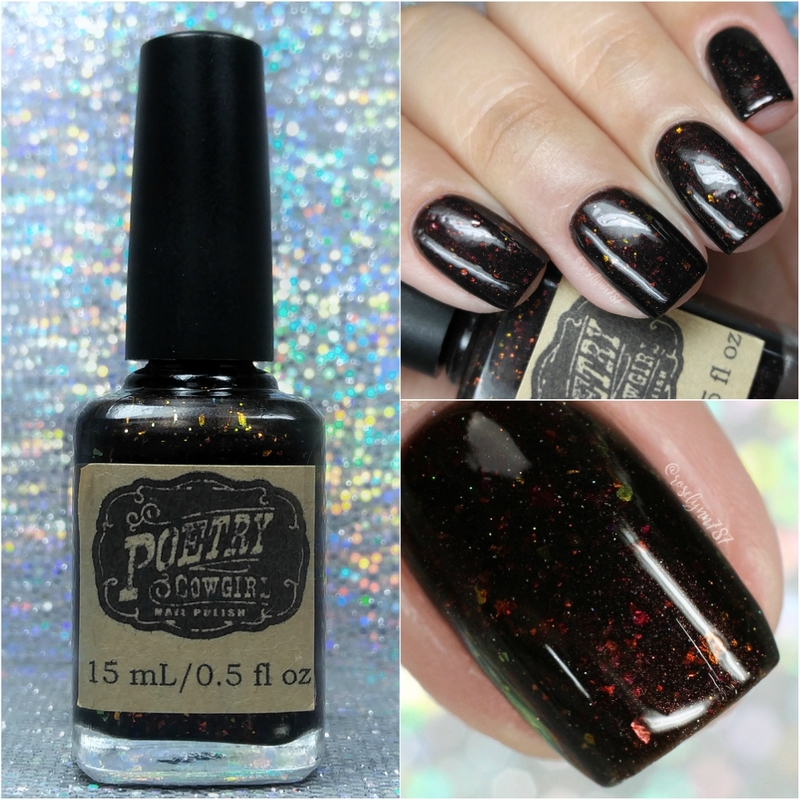 To recap, Frankly, My Dear by Poetry Cowgirl Nail Polish will be available for purchase through the Polish Pickup Shop August 4th through August 7th. This full-size shade will retail for $11.00 each.